Ever since Aquaman started production earlier this month, we've gotten a few glimpses from the set, but these images haven't shown off too much. 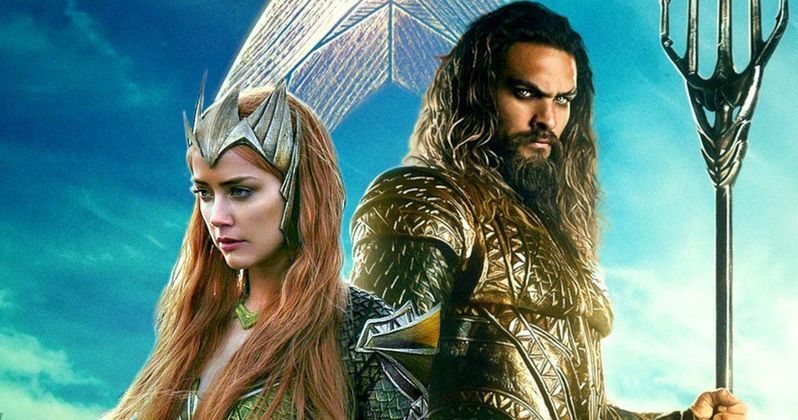 Today we have our first look at both Aquaman (Jason Momoa) and Mera (Amber Heard) together, in full costume. This marks the first time we have seen both Momoa and Heard shooting scenes at the same time. This photo surfaced on the Amber Heard Italia Twitter page, as filming continues in Australia. Most recently, new Aquaman set videos revealed some of the massive water tanks being used for some of the aquatic scenes in Aquaman, along with a glimpse at Aquaman's hometown of Amnesty Bay. The fishing village set at The Spit, near Palazzo Versace, featured a number of shipping containers that are dressed up as shops such as the Amnesty Bay Fish Co-Op and a shop signed Sunken Galleon, which are being built for the six-month shoot. It appears that this new photo was taken on one of the Amnesty Bay sets, but that has not been confirmed. While we don't get to see them in this photo, the Aquaman cast also includes Willem Dafoe as Nuidis Vulko, Temuera Morrison as Tom Curry, Dolph Lundgren as King Nereus, Yahya Abdul-Mateen II as Black Manta with Patrick Wilson as Ocean Master Orm and Oscar winner Nicole Kidman as Atlanna. The latest additions to the cast were Power Rangers star Ludi Lin, who came aboard last week to play Murk, leader of the Men-At-War soldiers, and Otis Dhanji, who will be making his feature film debut as the Young Arthur Curry. It isn't known if there are more characters who have yet to be cast, as Aquaman continues filming. We reported in December that this Aquaman movie is also eyeing a fall 2017 Italy shoot, with production beginning sometime in September in the town of Erice, on the Italian island of Sicily. It seems likely that this shoot may happen in early September, with this location serving as the last leg of the production, but that hasn't been confirmed. Still, with a lengthy five-month shoot ahead, more about about this superhero adventure is sure to surface. Now that our first look at Jason Momoa and Amber Heard on the set has been unveiled, it remains to be seen if the studio will release the first official image of these actors in costume as they appear in this particular Justice League spin-off. This set photo arrives just a few days after director James Wan unveiled the first look at Amber Heard as Mera, to commemorate her first day on set. James Wan is directing Aquaman from a script by Will Beall, based on a story the director came up with alongside DC Films president Geoff Johns. Warner Bros. has shifted the release date of Aquaman twice now, but it seems to have found its permanent home on December 21, 2018, where it will face Sony's animated Spider-Man movie. Take a look at this new Aquaman set photo below.